This PoE extender will allow you to extend your IP camera cable runs without needing additional power sources along the way. You will need to make sure you are using one of our high power PoE+ injectors to provide adequate power to the camera. 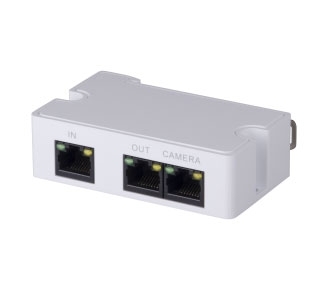 If you are using our low power small bullet or dome IP PoE cameras that require only a max of 7Watts, this device can be cascaded with another identical PoE extender unit up to a maximum 300m run, and has additional ports to connect up to 3 cameras when using two of them in tandem. If you are using one extender, you can connect up to two cameras to one extender. Transmission Distance Extends PoE transmission distance 100m when used with 30W PoE injector. When used with 60W PoE+ injector can be cascaded with second PoE extender for total 300m transmission distance from original PoE injector. Can I use this with the PoE ports on the back of the NVR? This PoE extender requires high power input from a PoE injector.